You want to spend your time enjoying your spa, not worrying about water care. 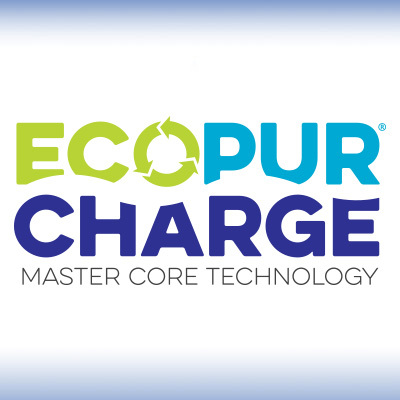 So we created EcoPur® Charge Master Core Technology – an exclusive filtration system that makes maintaining your hot tub’s water easier. Using the same multi-stage filtration techniques as Mother Nature, EcoPur Charge relies on a unique blend of copper and zinc to create an electro-chemical reaction that eliminates many micro-organisms and removes heavy metals. Best of all, it is designed so your spa can be ready to use at any time, with minimal amounts of water maintenance, so you can simply relax. Using EcoPur® Charge filtration reduces the amount of chemicals needed, saving you money each month and safeguarding your investment by protecting the swim spa’s plumbing and equipment against the corrosive effects of chlorine. 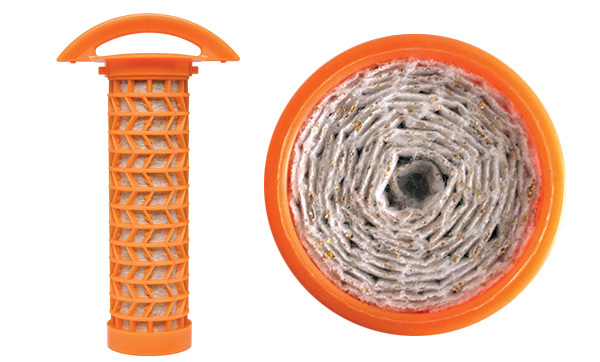 The new EcoPur® Charge is made from Master Spas' patented filtration fabric. With this design, the fabric is wound tightly into a nautilus master core, creating a catalytic cell. 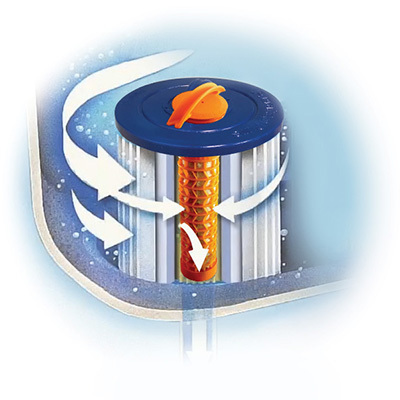 The nautilus fabric cell is encased by a unique "spring core" that allows for maximum water flow and water "charging". As the swim spa water comes in contact with the EcoPur® Charge master core, a chemical reaction causes zinc and copper hydroxides to form in controlled amounts. Like Mother Nature, when controlled releases of copper and zinc oxides are carried into the filtered swim spa water, they kill bacteria and create a hostile environment for algae and fungal growth. The water is also absorbing the special blend of minerals, including copper (Cu) and Zinc (Zn), which create an electro-chemical reaction that eliminates most microorganisms and removes heavy metals from the water, resulting in sparkling water that feels softer and doesn’t have the harsh chemical smells associated with normal systems. Ozone System: Every H2X Swim Spa by Master Spas also features an advanced Ozone system that kills pathogens and microorganisms, destroys organic materials, and oxidizes non-organic contaminants to keep your water clean and refreshing every time you use your swim spa. Mast3rPur™ Water Management System: The synergistic blend of three proven natural sanitizers provides water quality and swim spa care not found in any other swim spa, including salt systems. The Mast3rPur™ Water Management System dramatically reduces harsh chemical consumption, like chlorine, while removing many heavy metals and chloramines for water that looks crystal clear, smells fresh, and has a silky feel. This innovative, exclusive benefit is due to the power of three elements. When absorbed in water, ozone kills pathogens and microorganisms, destroys organics, and oxidizes non-organic contaminants. When germicidal UV-C light is exposed to water it inactivates microorganisms and breaks down chloramines. Each of the three elements are proven effective water management tools but when they are combined, their synergy makes them dramatically more effective through a chemical reaction known as Advanced Oxidation Process (AOP). AOP is superior to other systems because it produces powerful hydroxyl radicals that maximize disinfection and reduces chloramines fast and effectively. Clean, clear, fresh smelling, and better feeling water is available now with less work...another innovative, exclusive benefit only available through Master Spas on most models. Sitting in hot water up to your neck aids cardiovascular health?